Hello my name is Beattie. I am very sad because my owner is now too ill to look after me and I am having to look for a new home. At the moment I am staying at some boarding kennels that I have been used to going to for years, whilst I look for my new home. Well I actually live in the staff room, but I am quite happy and share it with 4 other dogs. I may like to live with another calm dog but we would have to meet a few times first for me to be sure, and I prefer dogs who are larger than me!. cages or rabbits are in cages I wont try and get at them through the bars. I love people though and dont mind being stroked and made a fuss of, and although I say it myself, I am in good shape and look far younger than my years and even play like a puppy. I do give very gentle staffy kisses, and am very relaxed and happy to give up my toys and I am very gentle taking treats. However as I am getting older now I think my perfect home would be either a home with a retired couple, or where any children are older, teenage children as I like some peace and quiet these days!. Thats not to say I dont want walks - I still love my walks and like two good walks a day. and lie down when told. I can be left for a few hours and I dont mind travelling in the car. Could you be my new home? If you think I could please contact Senior Staffy Club, it tells you how to below. Beattie is vaccinated, spayed and microchipped. However any adopter should be prepared to travel to meet Beattie where she is. Beattie is on our Matchmaker Scheme which means she is still with her present keeper. the adoption donation is a donation of your choice. in our care who have no one else to help them. 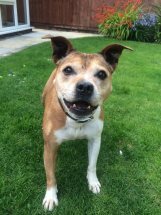 at seniorstaffyclub@hotmail.co.uk or call Wendy on 07505010823.